Whether you’re looking to buy, sell or simply maintain your self-storage property, understanding the factors that determine real estate and business value is an important part of your investment. In this book, authors Michelle Gigowski and Timothy Moffit apply valuation theory to help owners and investors understand how value within the asset class can be made, managed and measured. 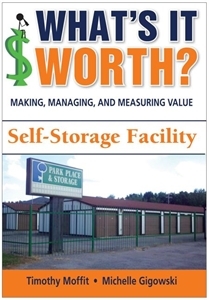 What’s my self-storage facility worth? Michelle Gigowski writes and consults in health-care administration, real estate intensive valuation practices and entrepreneurship. Her research interest is in organizational value building. She has co-authored books, articles and case studies on valuation and entrepreneurship. Timothy Moffit is chair of the Department of Economics and Business at Kalamazoo College in Kalamazoo, Mich. He holds a doctorate in business administration with a specialty in finance from Nova Southeastern University and a master’s in business administration from the Amos Tuck School at Dartmouth College. His teaching and research interests center on valuation theory, and the analysis and understanding of financial statements. The “What’s It Worth?” series is published by Value It Press. Additional titles in the series examine valuation for mobile home parks and self-serve car washes.